On a typical day, you may need to change your baby’s diaper a minimum of 5-6 times. If you are not using a quality baby wipe to clean the poops and pees then you will probably get into trouble with your little one’s delicate skin. On the other hand, it greatly helps you to avoid dirty hands during diaper changes. You must aware that, not all the wipes are same. They may differ in moisture, thickness, and softness. You have to select the best baby wipe for your little one based on the skin type and usage. Check the following important criteria while purchasing a baby wipe for your little one. Babyganics baby wipes are free from parabens, sulfates, artificial dyes and fragrance which itself make it the best natural wipe for babies with sensitive skin. It can be used on your baby’s face, hands and bottom. This hypoallergenic baby wipe is made from natural plant-based ingredients like Chamomilla Recutita flower extract and vegetable oil. Apart from this, it contains a blend of natural seed oils from tomato, sunflower, cranberry, red raspberry, and black cumin seeds which helps in healthy skin development and anti-oxidant protection. Its single pack contains a total of 100 wipes, each one measures 8inch x 6inch. When you need a safe and soothing wipe during the diaper change, Bodyguard is the best option. These wet wipes are one among the best natural wipes with 98% of de-mineralized water (the purest form of water) thus doesn’t harm your baby’s delicate skin anyway. The ingredients are buttermilk (skin moisturizer), beeswax (lock in moisture), shea butter(soften dry skin), aloe vera(soothes) and coconut oil to nurture the sensitive skin. Moreover, it is enriched with Vitamin E which blocks free radicals from the body thus it keeps your little one’s delicate skin rejuvenated all the time. Each pack contains a total of 72 wipes which can be easily pulled out from the peel off type adhesive packing and pasted back after use. Paraben & Alcohol-free: The BodyGuard baby wet wipes are paraben and alcohol-free thus they are safe for babies delicate skin. Also, it doesn't have any alcoholic content which keeps it soft and more wet to be used at any time. It is safe and gentle for everyday use on the baby's face or bottom. Ingredients like Buttermilk to keep baby's skin moisturized, Beeswax to help lock in moisture, Shea Butter to soften dry skin, Aloe Vera to soothe and Coconut Oil to help nurture sensitive skin. And all our products are made with 100% natural fragrances. If you are looking for an organic baby wipe then go for Mamaearth bamboo based baby wipes. It is India’s 1st organic bamboo based wipes, free from polyester. Bamboo fiber is more breathable than cotton fiber. Along with the unbleached organic bamboo, it has a fine blend of aloe vera, shea butter, almond oil and lavender oil which gently cleanses and soothes baby’s skin. It also enriched with Vitamin E which nourishes the baby skin. These wipes are perfect for cleaning messy hands, face and body of your baby. Its constant use won’t leave any rashes or redness because of the nature of its ingredients. Ingredients such as corn extracts, soya bean, lemon, aloe vera, coconut oil, Vitamin E and the purified water makes Trumom baby wipes 100% natural baby wipes and hypoallergenic. Trumom (USA brand) natural baby wipes are best for newborn babies as well as babies with a sensitive skin. These wipes are ideal to use on baby’s face, hands and bottom. It cleans the pee and poohs perfectly. It’s packing come up with a resealable sticky label, where you can pull out the wipes and seal it back after use. There are chances to lose the stickiness of the label which may result in moisture loss from the wipes. So, always keep it sealed when not in use. Cool & Refreshing: Trumom Baby Wipes make your baby feel cool and refreshing every time you use them. Wipes are soft and gentle on your baby's skin and protect it from friction or rash. Bey Bee water wipes are 98% water, perfect to clean pee and poop and it is made for newborn’s sensitive skin. It also contains aloe vera extracts which lock the moisture on your baby’s skin even after a rigorous cleaning section. Each pack contains a total of 80 wipes which are free from parabens, sulphates and alcohols. This pH balanced wipes are less prone to allergens and it is gentle on your baby’s delicate skin. If you need an Ayurvedic as well as biodegradable water wipe for your baby then, Mother Sparsh is the best choice. It is made from plant fabric, no polyester used. It contains aloe vera extracts and Vitamin E which nourishes the delicate skin of your baby. Apart from these ingredients, it is 98% of the water. Mother Sparsh baby wipes are clinically proven for preventing diaper rashes. Wipes can pull out from a sealed structure which effectively locks the moisture and prevent the wipes from drying. Luvlap wet baby wipes are enriched with aloe vera and chamomile extracts. While aloe vera creates a soothing effect on your baby’s skin, chamomile provides a calming effect because of its antibacterial and antiseptic qualities. It also contains Vitamin E extracts which act as a moisturizer. There are chances to lose the stickiness of the self-adhesive type packing seal and thereby dry up the wipes when it is half empty. So, careful sealing is required once you opened the packet. Himalaya gentle baby wipes are designed to soothe your baby’s bottom during a diaper change also clean up spills and spit-ups. Key ingredients are lotus and aloe vera. Lotus contains natural conditioning agents and aloe vera keeps the skin moisturized. It is free from alcohols, parabens, sulphates and silicones. It has packing of 12, 24 and 72 so that you can even give a trial using the smaller packs. Moreover, you can keep the small packs in your vanity bag during short travels. An ideal wet wipe to use after a meal time or a diaper change, made from fabric cottony soft honeycomb material which gives a pleasant soft touch to the skin. This Malaysian imported Wetty wet baby wipes are formulated to be mild on your baby’s delicate skin and have no sticky or greasy feeling after use. It contains aloe vera and Vitamin E for skin soothing and moisturizing. The packing has a plastic lid type opening which protects the wetness of the wipes for a long term. 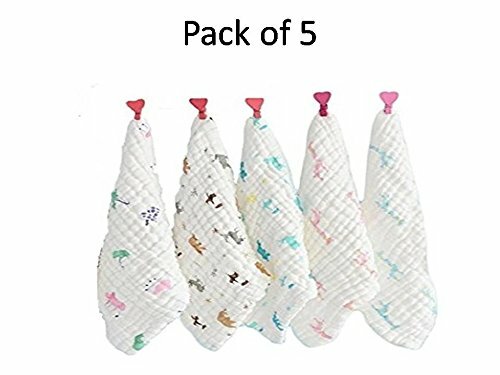 If you don’t want to use disposable wipes for your newborn, then go for reusable baby wipes like Muslin baby washcloths which can easily wash and reuse once soiled. Muslin wipes are made from natural muslin cotton which is softer than other cotton products. Muslin cotton is eco-friendly and has antibacterial properties. Its open weave makes it extra breathable which makes it perfect for your newborn. You can use this reusable wipe to clean saliva, burp, sweat, food residues and even as a small bath towel. Other than that, it is good to clean eczema, baby acne, and cradle cap. If you need some ordinary cotton wipes under a budget price of INR 500, wonder cares reusable cloth wipes are one of the best choices. The pack contains 10 wipes with assorted color prints along with a free box to keep the wipes safely. It is made from cotton flannel, an environment-friendly product. You can use these wipes to clean saliva, spit-ups and food residues. In the above list of best baby wipes, Mamaearth Baby Wipes and Mother Sparsh Baby Wipes are my personal. MamaEarth is an organic wipe, so no need to worry about any kind of skin irritations meanwhile Mother Sparsh is an ayurvedic wipe with a biodegradable feature.